Featured Image: The Mariana Trench by by J.Sun. Fair Use. Scientists may have found evidence of life underneath the deepest point in the ocean, and that could be good news for anyone hoping to discover aliens on other planets. 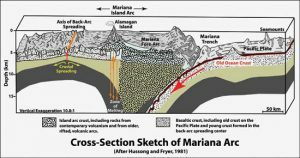 Cross section of the Mariana Arc showing the Mariana Trench. The diagram was generated by the U.S. National Oceanic and Atmospheric Administration following the 2004 Pacific Ring of Fire expedition. TRUMP CANNOT BELIEVE WHAT THE NYPD JUST DID TO ILLEGAL IMMIGRANTS IN NEW YORK CITY! The violent MS-13 gang has once more shown why we need Donald Trump’s wall along our southern border. HEADS WILL ROLL! JEFF SESSION’S BRUTAL MESSAGE FOR DEMOCRATS SHOCKED EVERY REPORTER IN THE ROOM! Featured Image: Mexican Border town prostitutes. Many if not most are forced into prostitution while trying to get to the USA illegally. As the number of Central American women and girls crossing into the U.S. continues to spike, so is the staggering amount of sexual violence waged against these migrants who are in search of a better life. According to a stunning Fusion investigation, 80 percent of women and girls crossing into the U.S. by way of Mexico are raped during their journey. That’s up from a previous estimate of 60 percent, according to an Amnesty International report.This year alone, immigration authorities expect more than 70,000 unaccompanied minors to come through the United States unlawfully, the majority of whom are from Central American countries of El Salvador, Guatemala and Honduras. The number of unaccompanied Central American girls caught at the Southwest border has rapidly outpaced the number boys, according to a July Pew Research study.Through May, the number of unaccompanied girls younger than 18 caught at the US-Mexico border increased by 77 percent. But while many of these girls are fleeing their homes because of fears of being sexually assaulted, according to the UNHCR, they are still meeting that same fate on their journey to freedom. Description: An ICE detainer was denied for an Illegal Immigrant man being charged with sexually assaulting a young girl. Travis County Sheriff Sally Hernandez has not honored several ICE detainer requests for illegal immigrants being charged with violent crimes. ICE detainers were also denied for an illegal immigrant that was recently arrested for beating his girlfriend outside of a bar and an illegal immigrant that was wanted since 2014 for charges of sexually assaulting a 7 year old twice. Saying that elected officials don’t get to pick and choose which laws they obey; Texas Governor Greg Abbott has called for a crackdown on sanctuary cities in Texas. THIS IS THE MOST POWERFUL ARGUMENT I HAVE HEARD AGAINST SANCTUARY CITIES IN AMERICA. TRUMP SUPPORTERS TRAVEL 450 MILES TO SACRAMENTO TO FIGHT ILLEGAL ALIEN SANCTUARY BILLS. The Aliens have Landed – Battle Star Struck Trek Wars Gate in Indianapolis! 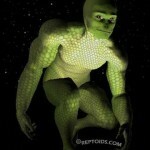 The Aliens Have Landed in Indianapolis! This will mark the fourth year in a row that this author has attended StarBase Indy. And it is always a fun time. Hanging out with the stars (and fans) of Star Trek, Stargate, Battlestar Galactica, or Star Wars, is an interesting conflagration of weird make up, costumes, (currently) impossible technological gadgets and gizmos, maybe a little magic and time travel for good measure. And it’s an escapist dream come true. Last year I went in my character of Jabez Cain, time-travelling mercenary slash troubadour. As a truly unique experience, Starbase Indy is right up there with a tenth row seat at a Weird Al Yankovik stage production: Amazing fun, amazing costumes, amazing organization and coordination. It all leaves you wondering just what the hell happened and when can we do it again? This year, in addition to promoting my books and magazines, we’re there showcasing our newly incorporated enterprise, Possum Holler Entertainment, LLC. Video and audio capture, editing, mixing, reproduction, and performance support, event coordination and promotion. Stop by our table to hear or view some sample pieces and discuss what we can do for you. A man who claimed to be a former Lockheed Martin engineer said on his deathbed that aliens are real and have visited Earth, in a now-viral video posted to YouTube. Boyd Bushman, who claimed to be a Lockheed Martin and Texas Instruments engineer, died on August 7th at the age of 78, but left behind a video with explosive claims about possible extraterrestrial life. . . . Read Complete Report. Shortly before Boyd Bushman passed away on August 7, 2014, he was video recorded candidly speaking about his personal experiences with Area 51, UFOs, aliens and anti-gravity ideas. Boyd was a retired Senior Scientist for Lockheed Martin. His career spanned over forty years, was awarded many patents, and included work with defense contractors Hughes Aircraft, General Dynamics, Texas Instruments, and Lockheed Martin. Featured Image: Dwight D. Eisenhower photo portrait. SOURCE Wikipedia. (Public Domain). Eisenhower threatened to take part of the Army and attack Area 51 if he didn’t get some answers . . . from Deathbed Confession below. Featured Image: Viracocha face in Peru. CREDIT: Piotr Wojtkowski SOURCE: Public Domain Pictures. Deep within the jungle and high atop the mountain peeks of Peru are the living remains of an ancient advanced people who still live among us today. Discover the Hidden Planet of the Inca.